Summary: Community bankers know they need to prepare for disasters. But, in the wake of Hurricane Florence, we have some important reminders. All things old become new. If you are old enough, you may remember the refillable milk bottles back in the day. Well, now you can refill your beer bottles in Oregon. Specially formulated refillable beer bottles are being filled, returned, cleaned, and filled again by seven breweries. As the breweries scale up, cost savings are expected and customers could benefit from lower prices. Stay tuned to see if it catches on elsewhere. 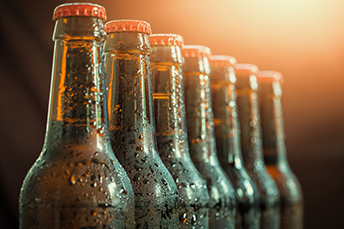 Community bankers have more to worry about than refilling their beer bottle though when it comes to natural disasters. Hurricanes and tropical storms are also problems that aren't going away. When hurricanes Harvey and Irma both hit Texas last year, it was the first time the US had ever endured two Category 4 hurricanes in the same year. Hurricane Florence, although not as powerful, hit North and South Carolina in September, reminding us that wind, rain and flooding can be very damaging. Know your power requirements. Power is the top asset that banks struggle to maintain or regain. Ask an electrician to define your power needs now, so you'll know how much juice you need to run your bank if and when the public power grid goes down. Have access to multiple vendors. Generators and fuel are in very high demand after a natural disaster. It may not be possible to telephone the local rental or fuel supply company to have them deliver what you need. The same storm might hit their business too, leaving them with reduced capacity. Reach out to a handful of vendors now, including businesses outside your geographic area. Let them know about your power requirements and your interest in being a customer during and after the next big storm. If they have a preferred client list, ask to be on it. Prepare your employees. For your workers, taking care of themselves, their homes, and their families is job #1. Yet, you won't be able to recover from a natural disaster on your own. You need your employees, so be sure everyone is protected now. Help employees help you by deciding how you'll communicate with staff during and after a major weather event. Then form a disaster relief committee. Employee resources are available to download from FEMA, so share them with staff and remind everyone to assemble emergency kits and plan escape routes. Hold workshops with a disaster preparedness professional who can discuss advance steps employees can take. Finally, let employees consider ways they might help each other, perhaps taking essentials to people in need or letting a coworker stay in a guest bedroom. Even with prepared staff members, your bank will still operate with a skeleton crew in the wake of a national disaster. Some of your employees may be subject to mandatory evacuations and may find it difficult to return, if their homes flood or the area between an emergency shelter and home is impassable. Be ready to meet immediate customer needs, especially for cash, with just a small proportion of your usual staff to help. Square recently announced that it will launch a mobile app which gives its payroll service customers easy access on the go to manage payroll, and is the latest move by Square to woo small businesses.